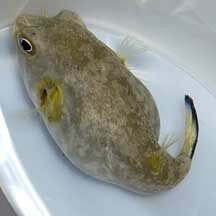 Pufferfishes are poisonous to eat! They can inflate themselves with water or air to deter predators. But don't force a pufferfish to do this. They have powerful teeth and can give a nasty bite. Where seen? These rotund fishes are sometimes seen on some of our shores. They are found among seagrasses, near coral rubble as well as in mangroves. What are pufferfishes? Pufferfishes belong to the Family Tetraodontidae. According to FishBase: the family has 19 genera and 121 species. They are found in tropical and subtropical ares of the Atlantic, Indian and Pacific oceans. Other similar fishes belong to different families: boxfishes and cowfishes to Family Ostraciidae, and porcupinefishes to Family Diodontidae. Features: 10-30cm. Pufferfishes are slow moving fish that are hardly designed for fast swimming. When relaxed, they are generally elongated bulbous fishes. Pufferfishes get their common name from their ability to inflate the body greatly by swallowing water (or air, if it is out of water). They do this when they are stressed. Fully inflated, they resemble balloons. 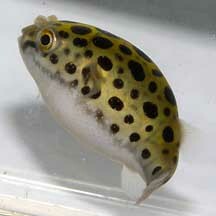 This probably helps make a pufferfish more difficult to swallow and thus deters predators. They are sometimes also called blowfishes. Please don't tease pufferfishes or force them to inflate themselves. It is cruel to do so. Poisonous puffers: Many pufferfishes are highly poisonous to eat. The pufferfish harbours tetraodotoxin. This potent toxin may be concentrated in the intestines, reproductive organs or skin. Even dead fishes can poison anything that eat them. The tough skin lacks scales. Most species are covered with with tiny spines, some have fleshy filaments. In most, the underside of the body is white while the upper side may have various patterns. The gill opening does not have a cover and are simple slits in front of the pectoral fins. They lack pelvic fins. What do they eat? Some species appear to eat whatever they can find. Others may specialise in eating algae or invertebrates. Some may scavenge. The mouth is small and teeth fused into a beak made up of four fused powerful teeth. The scientific name comes from the Greek 'tetra' which means 'four' and 'odous' which means 'teeth'. 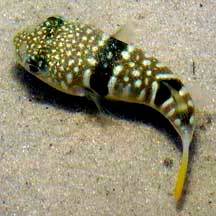 Puffer babies: Pufferfishes lay eggs in a nest and it is presumed that the nest is defended. Human uses: Despite their toxic nature, pufferfishes are eaten in Japan as a delicacy. Status and threats: Our pufferfishes are not listed as among the threatened animals of Singapore. However, like other creatures of the intertidal zone, they are affected by human activities such as reclamation and pollution. Over-collection can also have an impact on local populations. Photo shared by Rene Ong on facebook. Photo shared by Ivan Kwan on facebook. *from Lim, Kelvin K. P. & Jeffrey K. Y. Low, 1998. A Guide to the Common Marine Fishes of Singapore. Yelloweye Puffer (Arothron immaculatus), Rough Golden Toadfish (Lagocephalus lunaris), Milk-spotted Puffer (Chelonodon patoca) and Spotted Green Puffer (Tetraodon nigroviridis) Lim, Kelvin K. P. & Jeffrey K. Y. Low, 1998. A Guide to the Common Marine Fishes of Singapore. Singapore Science Centre. 163 pp. Puffer or Globe fish Tan, Leo W. H. & Ng, Peter K. L., 1988. A Guide to Seashore Life. The Singapore Science Centre, Singapore. 160 pp. Family Tetraodontidae (Puffers) and Arothron immaculatus (Immaculate puffer) and Arothron mappa (Map puffer) and Arothron stellatus (Stellate puffer) and from FishBase: Technical fact sheet on the family. Don't eat toxic fish balls! on the wild shores of singapore blog: about a case of pufferfish poisoning and other uses of pufferfish toxins. Arothron hispidus. Singapore Biodiversity Records 2013: 1. Allen, Gerry, 2000. Marine Fishes of South-East Asia: A Field Guide for Anglers and Divers. Periplus Editions. 292 pp. Kuiter, Rudie H. 2002. Guide to Sea Fishes of Australia: A Comprehensive Reference for Divers & Fishermen New Holland Publishers. 434pp. Lieske, Ewald and Robert Myers. 2001. Coral Reef Fishes of the World Periplus Editions. 400pp.